This deal is back, and it's still an excellent price. We can think of worse ways to round off the year. Chromebooks are getting pretty good these days, and a perfect example of this is Acer's new Chromebook 15. We last saw this discounted a couple of weeks ago to as low as $319, but the latest deal that Best Buy is offering tops that pretty handily. You can currently get a Chromebook 15 for only $299.99 ($100 off), plus a free Google Home to boot. This model of the Chromebook 15, the CB515-1HT-P39B, comes with an Intel Pentium N4200, 4GB of RAM, and 32GB of storage that can be expanded via microSD. That Pentium isn't top-end, but it usually keeps the OS moving along smoothly. The display is a 15.6" 1080p panel, which is very large among Chromebooks. Also present are two USB Type-C ports and two standard USB 3.0 ports. Best Buy is not only taking $100 off the MSRP, but it's also sweetening the pot by throwing in a free Google Home. 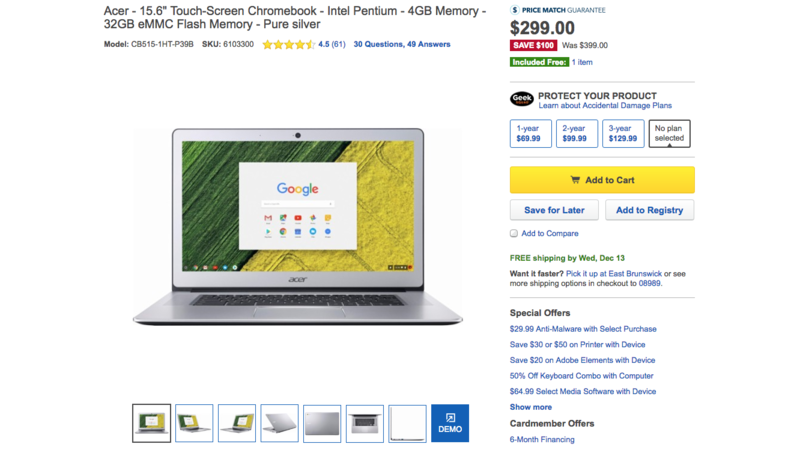 That's a pretty killer deal, especially considering how new (and nice) the Chromebook 15 still is. Plus, there's free shipping! Hit the source link below to grab a Chromebook 15 (and Google Home) of your very own.